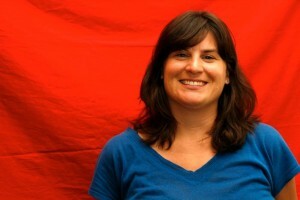 Last fall, a short article published in a small town Oklahoma newspaper caught our attention. 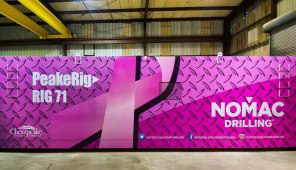 The article described an oil and natural gas drilling rig that Oklahoma-based Nomac Drilling had turned pink in honor of breast cancer “awareness.” We were aghast. We’d seen many instances of pinkwashing, but this was especially egregious. Nomac Drilling and their parent company, Chesapeake Energy, are among the biggest natural gas producing companies in the country. They routinely use hydraulic fracturing (“fracking”), as a method of extracting ever more oil and gas from deep within the earth’s surface. We know that over 700 chemicals are commonly used in the process of drilling and fracking for oil and gas, including dozens that are listed as “chemicals of concern” because of their link to multiple health harms. Benzene, Acrylamide, Ethylene Oxide, Bisphenol A, formaldehyde, lead, and Di (2-ethylhexyl) phthalate are all known carcinogens or endocrine disruptors that are widely used in the fracking process and have proven links to breast cancer. The idea that Nomac Drilling would turn pink a drilling rig used in a process that could expose people to harmful chemicals linked to breast cancer motivated us to take action. We sent a letter to Chesapeake Energy’s CEO demanding that the company, along with all of its subsidiaries, commit to not using chemicals of concern that are linked to health risks, including breast cancer, in any of its operations. If they care so much about breast cancer, they shouldn’t introduce chemicals linked to the disease into the water we drink and the air we breathe. When we didn’t hear back from Chesapeake Energy, we asked you, our members, to take action. Nearly 2,000 Breast Cancer Action activists wrote to Chesapeake, asking them to stop pumping poisons into the earth and into our bodies. Our work is by no means over. In fact, this is just the beginning. Fracking is an inherently dangerous process, and the industry is growing. We have to demand an end to fracking across the country and stop cancer before it starts. Hydraulic fracturing is the process of taking millions of gallons of water, mixing it with tens of thousands of gallons of chemicals, including known carcinogens and endocrine disruptors, and pumping the mixture deep below the earth’s surface with extreme pressure to break up rock formations and release oil or natural gas. Once underground, the chemical/water mixture can leach into the water supply and impact people living nearby whose well water may be contaminated. But its reach doesn’t end there- – toxic chemicals have been found in nationally-distributed food, produce (even alcohol) grown on land contaminated by fracking. Additionally, contaminants from fracking find their way into the faucets of faraway cities once they seep into the water table. Fracking is not just a small town, rural problem; the impacts of this grossly under-regulated industry are widespread. The fracking process exposes us to known carcinogens and endocrine-disrupting chemicals. But because companies refuse to release comprehensive lists of chemicals used (they consider them “trade secrets”), it is impossible to pinpoint which chemicals are used by any individual company or at any specific operation site. Companies engaging in fracking refuse to take responsibility for, or even acknowledge, the public health risks involved. The fracking industry is grossly under-regulated and poses a fast-growing threat to public health. Fracking is a booming business right now–it enables oil and natural gas companies to extract more fossil fuels than they otherwise could. Low natural gas prices, coupled with a society with ever-increasing energy needs, mean that demand for fracking is sky-high. Energy companies are expanding their reach across the country and staking claim to wells as part of a mad rush to start pumping chemicals into the earth–all in an effort to extract oil and gas from the earth as quickly as possible. In response to the fracking boom, a movement of organizations and individuals has come together to challenge the devastating consequences of this practice. Environmental organizations, public health organizations, land-owners and community groups are working regionally in areas where fracking is ongoing. In order to pro-actively protect human health and the environment, this movement is now organizing on a national level to demand moratoriums or bans on fracking before the practice becomes even more prevalent. 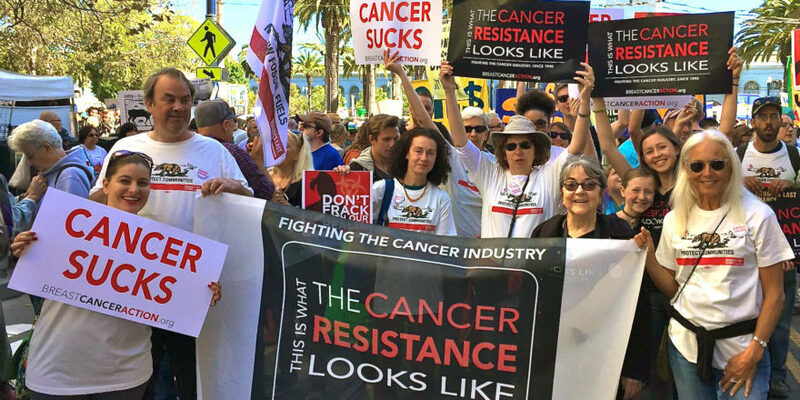 Breast Cancer Action is proud to take our place in this movement against fracking, and as so often happens we are one of the only health organizations currently involved. We are driven by our belief in the precautionary approach to public health: if an action or policy has a suspected risk of causing harm to the public or to the environment, then the burden of proof rests with those taking action to demonstrate their actions will not harm public health. There has been no comprehensive study or analysis to prove that fracking is safe. Instead, there are many reasons to believe that fracking causes harm to human health, including increased risk for breast cancer. We cannot and will not wait until hundreds or thousands of women die to take action. We have long been committed to stopping cancer before it starts, in addition to supporting women diagnosed with the disease, and to do so we need to stop cancer-causing toxins from entering our world and bodies in the first place. Fracking is part of this work to create healthier environments for all of us. As a breast cancer organization long concerned with the impact of unregulated toxic industries, without corporate funders to appease or please, we can bring a strong feminist public health analysis to the movement against fracking. Since last fall, we have already made significant contributions to the movement to stop fracking. We called out Chesapeake Energy and Nomac Drilling’s pinkwashing in November and began to educate breast cancer activists across the country about the impacts of fracking. In December, we became a founding member of the Americans Against Fracking coalition – a national coalition of over 100 environmental, civic, health, and business organizations that are coordinating a national strategy to ban fracking. We also signed on to state and national letters to legislators demanding bans on fracking and helped expand the reach of the anti-fracking movement to women living with and affected by breast cancer. We will continue to grow our leadership role in shaping national anti-fracking strategy and we will do more to highlight examples of pinkwashing by fracking companies like Chesapeake Energy and Nomac Drilling. We look forward to mobilizing you, our members, to write letters to the editors of local, regional and national newspapers, to give testimony at hearings where fracking regulation is under consideration, and to urge elected officials to outlaw this practice that is bad for our long-term health. We are keeping our eyes and ears open to new and promising opportunities. The movement to end fracking is building momentum now, and we are looking forward to playing an important role in protecting women, and all people, from the inherent health risks that fracking poses. We hope that you will join us.